At the Long Island Aquarium in Riverhead, “Mermaid Mondays” last through Labor Day. A recent summer day found Nicole Oliva sitting at the edge of her swimming pool in Holbrook, not dangling her feet over the water’s edge but wriggling, twisting and willing her legs — slathered in hair conditioner — into a 30-pound silicone mermaid tail. Step 1: Oliva spreads the tail out on a mat in front of her, positioning it so that she can finesse her way into it. Step 2: She applies the conditioner to both legs, from her feet to her thighs. Step 3: Oliva sits poolside and puts one leg at a time into the tail, pushing her feet into the monofin at the end that resembles a flipper. Step 4: With her pelvis raised off the ground and her elbows planted on the mat, she pulls the mermaid tail up from her knees toward her waist. Step 5: The shimmying begins, as Oliva adjusts the tail to her contours and pulls at the silicone until it is wrinkle-free. Oliva said she knows when she’s done based on how the tail feels against her skin. What used to require a half hour now takes Oliva a little less than 10 minutes. For some, the magical world of mermaids means more than an animated Disney character. It’s a lifestyle that encourages camaraderie and a sense of belonging. 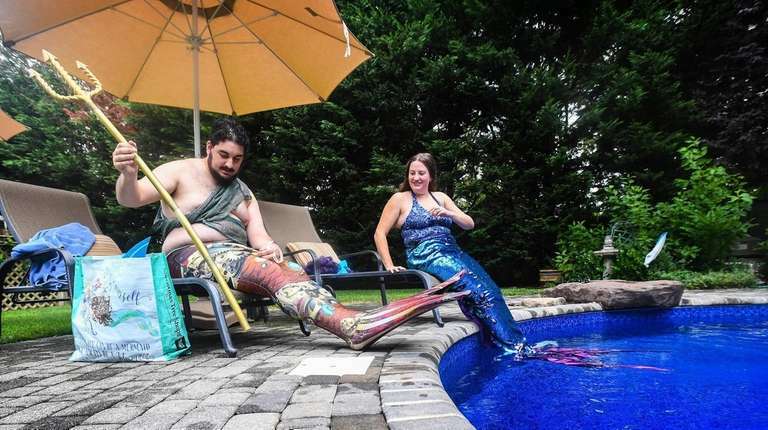 That was so much the case for Oliva that in 2016 she started a Facebook page and created a pod — a group of men and women who perform or practice as mermaids and mermen — that has grown from seven people to about 30 active members on Long Island. Six years ago, while designing a costume, Oliva set out to create her own mermaid’s tail. Her research and Google searches revealed an entire community of mermaids, in pods from North Carolina to Singapore and at mermaid festivals that have sprung up in Michigan, Georgia and North Carolina and include the annual and long-running Mermaid Parade on Coney Island. Oliva’s pod meets every other month for group swims at aquatic facilities, public pools or members’ homes. They practice technical swimming and theatrical performance stunts, such as front and back flips, barrel rolls and fluke stands — which involve them standing on the tip of their mermaid tail. They also work on making underwater bubble rings, bubble hearts and bubble kisses that are part of their shows at the Long Island Aquarium in Riverhead. On “Mermaid Mondays,” from July to Labor Day, visitors can pay $39.95 to swim with the mermaids in one of four daily sessions or interact with them on dry land during meet-and-greets. In the real-life mermaid world, pod members have alternate identities and speak in mermaid jargon. Oliva goes by the name Mermaid Aria, and others are known as Mermaid Marina, Mermaid Caylis and Mermaid Rose. Helpers or assistants are known as mer-tenders, boyfriends are merwranglers, and if you are a member of the mermaid collective, you are merfolk. Kai Wagner, 27, who identifies as a transgender man, joined the Long Island pod three years ago but has been interested in the mermaid lifestyle for five years. The Lindenhurst resident has gender-specific mermaid personas. As a woman, she is Mermaid Pearl, as a man he is Merman Atlas. “I love the aesthetics of both lady mermaids and male mermaids,” said Wagner, who owns and operates Spoonful of Sugar Entertainment, a staffing agency that provides mermaid and princess personas for private events, birthday parties and the Long Island Aquarium. His company employs four mermaids, plus Wagner, at the aquarium in Riverhead, all of whom belong to a micro-pod within the larger Long Island pod. Mermaid Mondays began in 2016 and attract visitors from as far away as New Jersey, said Darlene Puntillo, the aquarium’s spokeswoman. “We’ve also introduced a dry meet-and-greet, which has been very popular among young girls,” Puntillo said. The aquarium mermaids said their relationships extend beyond just being co-workers. “It brings everyone together,” said Daniella Tiranno, 26, of Bayport, who recalled having to lie face down as her co-worker wrestled with the zipper on the back of her mermaid tail. The first time Tiranno, aka Mermaid Marina, tried on her tail, she said it didn’t register that she wouldn’t be able to walk, and she quickly fell to the mercy of her mertenders. “It feels good to swim with people you know and trust,” she said. Though Oliva’s pod is relatively new to Long Island, the world is well-familiar with mermaids. Half-man, half-fish legends date to Greek mythology, with characters such as Triton, the fish-tailed sea god. Jules Verne’s 1870s novel, “Twenty Thousand Leagues Under the Sea,” also featured underwater creatures that resemble men. 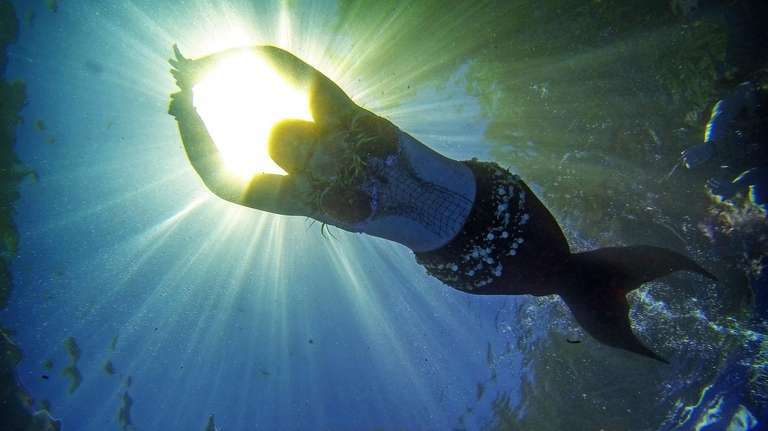 Modern-day mermaid enthusiasts also take inspiration from the 1950s, when Disneyland employed eight mermaids to launch the new Submarine Voyage attraction in California, and more recently from Hannah Mermaid and Mermaid Kariel, who have been featured in a national advertising campaign for Atlantis Paradise Island, a resort in the Bahamas. Long Island’s pod of mermaids gets together once a month to craft headdresses and shell bikini tops or teach each other tricks. Their “second skin” usually consists of neoprene, silicone and spandex. Tails can weigh up to 60 pounds and range from $100 to $4,000. Some mermaids use monofins, a finlike rubber or plastic accessory that fits inside the fin portion of the mermaid’s tail and helps them swim underwater. Many of the mermaids purchase their tails but create their own shell bikini tops for a more hands-on approach. Crafting is a big part of the mermaid lifestyle and allows merfolk bonding time with one another. The process of making a top begins by applying a thick acrylic paint to the lion’s-paw shells. Next, iridescent faux gemstones are affixed with an adhesive. In the final stages, a waterproof sealant is applied and then a decorative strap using fishnets, imitation pearls or flowers to keep the top in place. Sinead Atkinson, 26, of Hauppauge, is a substitute teacher and a member of the Long Island pod. Her elaborate, 26-pound tail is a silicone and neoprene hybrid with iridescent, multicolored resin scales that she bought used for $950 (it would have cost $1,500 if purchased new). Like many of her fellow mermaids, Atkinson — she was a student at SUNY New Paltz when she discovered a video of someone making a mermaid tail out of spandex — has a background in theater and costume design. For Hannah Palmer, 31, who last year moved from Aurora, Colorado, to Hicksville, with a stop in Florida, camaraderie and her new pod family are everything. She said she applied dozens of times to be a princess at Disney World in Orlando, Florida, before she “finned-up” last year for her first mermaid swim at a birthday party for a 1-year-old. “I got in the water and was like, ‘Oh, this is where I have always been meant to be,’ ” said Palmer, who is known as Mermaid Meara. Members of the pod said relatives, friends and co-workers have been supportive of their mermaid personas. Breathing techniques are just as important as the athleticism, and the ability to hold your breath is key as a performer. Wagner said he can hold his breath for 90 seconds, enough time for him to swim a lap in an Olympic-size pool or 50 meters. Aside from the rigors of performance, being a mermaid has helped some in the Long Island pod to overcome life challenges. Mary Grecco, 26, said she turned to swimming and video games as early as elementary school to cope with being bullied. The combination, along with her childhood fascination with the movies “Splash” and “The Little Mermaid,” pulled her into a life a mermaiding, she said. “My demons tried to drown me, but they did not know I could breathe underwater,” said Grecco, who lives in Centereach and credits the mermaid community for helping her feel better about herself. She goes by the name Mermaid Rose and works with children with disabilities. The mermaids in Long Island’s pod all agree that children are their biggest advocates and fans. “You believe you are a mermaid, but they convince you,” Wagner said. And for those who remain unconvinced? “I just give them a little splash with my tail,” he said.